The year was 1981, the place was Seattle, and I was in my first year of naturopathic medical school. It is altogether possible that someone that long-ago year in my Naturopathic Philosophy class made mention of the fact that "heal" literally means "to make whole." And I surely must have jotted this down in my notebook, having recognized it as the pearl of wisdom it is, though truth be told I was blissfully unaware at the time that "making whole" more often than not involves oh so very much more than antioxidants, colon cleansing and Echinacea. What surely was not mentioned in that class, however, is the most interesting fact that the words "heal," "whole," and "holy" all spring from the same Old English root word: "hal." This implies that a state of holiness is a state of true health, which is in fact a state of wholeness. When I signed up to be a naturopathic physician, never in the farthest reaches of my imagination did I dream that my efforts to help my clients would eventually lead me to my current specialty of treating common non-physical causes of physical illness. This specialty has everything to do with wholeness, because the truth of who we are encompasses ever so much more than our physical bodies alone. At that time I certainly couldn't foresee how my ever-expanding search for wholeness would lead me to an unexpected place at the heart of human holiness. Wholeness begins with the quantum level of reality. Quantum refers to the smallest amount of a physical quantity, such as energy or matter, that can exist independently. It is this smallest level, this invisible level of reality, that forms the underpinnings of our physical reality, including our physical bodies. Therefore, where matters of healing are concerned, it is important to be able to discern when an illness takes its root at the quantum level. If this remains unrecognized by patient or physician, both will stumble around in the dark trying repeatedly to address the problem on the physical level of reality, with less than satisfactory results. So it often behooves us, when confronted with a physical condition that is not resolving easily with diet and other well-placed changes on the physical level, to consider that there may be something amiss on the quantum level of reality. What might some of these things be? Miasms are an example of a quantum level imabalance. This is because miasms are vibrational templates or blueprints. And as can be seen in the testimonials and in my published articles, the treatment of these vibrational maladies often results in significant healing of physical illness. Chakra imbalances and injuries are another example of dis-ease at the quantum level. Chakras are energy centers of the body. Each primary chakra is associated with a specific endocine system gland. For example, the fifth chakra is located in the area of the throat and is associated with the thyroid gland. Disorders of the thyroid gland are quite common in women these days, and there are many well-known physical-level reasons why this is occurring. Let's take a brief look at a non-physical reason for hypothyroidism that is frequently overlooked. This particular reason is planetary in scope. It has to do with the habitual way most women keep a tight lid on their "voice," on their truth, on what needs to be said. One of the consequences of this is repression of the fifth chakra, the chakra that rules the power of speech, the power of truth-telling. Decades of habitual self-silencing can result in imbalances of this chakra, and this in turn can contribute to thyroid gland disorders, particularly hypothyroidism. Unhealed past life issues are yet another cause of physical illness. I treated a young man a few years back who was the epitome of vibrant health except when he got the common cold. Colds would lay him out flat for days at a time, bedridden with intermittent chills and overwhelming weakness. My muscle-testing indicated that he had died of malaria in a recent past life, and the trauma of this was still imprinted within him, awaiting healing. So he received a homeopathic remedy for this malarial imprinting, and since then when he gets a cold, he is not laid out flat by it. It remains just a common cold, and he is able to function normally while it runs its course. Here is another example of a past life healing, experienced by Amy Weiss, daughter of past life regression expert, Brian Weiss. Some disturbances on the quantum level are part of a category that I call "things that go missing." Let's look at one thing that can go missing and cause a breach in the tapestry of the self: Power Loss. We are able to function in the world largely because we have all kinds of power that we take for granted. A client shared a dream of hers with me months ago: "I am riding a bike down a hill. As I near the bottom of the hill I need to steer the bike, but then I see that it doesn't have any handle bars." Handle bars enable the bicyclist to steer. This dreamer was being shown that she was having trouble steering her own life. This is a power -- a power that most people take for granted. Until very recently, most indigenous cultures throughout the world had a form of healing called shamanism. The primary difference between the shaman and our medical doctors is that shamans were highly skilled in diagnosing and treating non-physical causes of illness. These causes are completely invisible to orthodox western medicine. Therefore, if power loss is the cause of a particular client's condition, it will be quickly pin-pointed and treated by the shaman. By the same token, it will remain entirely invisible to the western medical physician. Return of one's power means that a missing piece of the self has now been reintegrated, and therefore another step towards wholeness has been taken. If the client allows this missing part of him/herself to return, this will inevitably enhance their physical well-being. Unhealed trauma is one of the most common and most overlooked non-physical causes of physical illness. 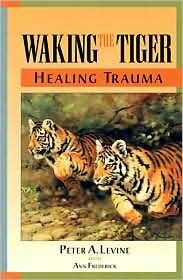 Overwhelming trauma is often dealt with by the psyche in a brilliant, instantaneous way. The psyche compartmentalizes the trauma so that the conscious self has no idea that the compartment and its contents even exist. This enables the person who experienced the trauma to keep on functioning more or less capably in the everyday world. Although it is a brilliant emergency measure, compartmentalization of trauma eventually begins to cause problems. This is because 1) it takes quite a bit of energy to keep highly charged emotional energy walled off from the conscious self, and 2) the walled off information creates a state of separation within the self. As we saw in the first paragraph of this section, true health is the result of wholeness. Compartmentalization of the self will cause illness at some point down the road, perhaps even decades after the originating event. These are but a handful of the many non-physical causes of physical illness. Ancestral issues, energetic toxicity, belief systems, subtle body imbalances and spirit inhabitation are just a few other examples. I hope this page on quantum healing has given the reader a more solid understanding of what I mean by non-physical causes of illness. Please consult Useful Links for additional reference material on this vast subject.